Secure your property against lock-snapping. Lock snapping is on the increase significantly in the Barnsley area now! The locks on uPVC doors and some composite, aluminium, patio and wooden doors are called 'euro cylinders'. These are made of soft but non-corrosive metal brass, relatively cheap to produce and can be made in various sizes to suit all door types. However there is a weak point within the cylinder itself which has been exposed recently, especially over the internet and on 'YouTube'. With a little knowledge and force, the cylinder can be snapped in half and extracted from the door. This usually involves breaking the handles first and then the lock can be manipulated to open. All a bit technical, but you can be assured that these anti-snap locks will protect your home and property for the long term future. As mentioned, to get to the lock itself the thieves usually have to break the handle first. Great news, your handles can also be upgraded to a 'pas 24 handle'. These handles cannot be broken and put a visual deterrent out to the thieves too. Simply put, they will take one look at these handles and think about going somewhere else! They don't suit all types of doors, but certainly do fit the vast majority of doors within the Barnsley area. If you add an anti-snap lock to a pas 24 handle you will have the ultimate protection to your property. 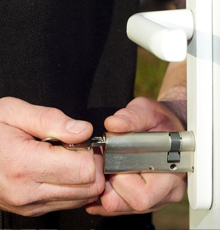 For more information on anti-snap locks in Barnsley contact SF Locksmiths now. Competitively priced, impressively quick, came with top banter. Would recommend!